Well its been a year! I remember on New Years Eve I only made one resolution, to put 2009 behind me and focus on the future, and you know what, I have achieved this I feel. With help from the wonder drug, I was able to put my anxieties and the trauma of Joseph's prematture birth behind me, and focus on the future. January was an amazing month, still cold, but at the end of the first week of January we flew to Australia. Joseph's first adventure went smoothly, we had two glorious days in Dubai, and then onto mum and dad's. It was so wonderful to see them, I hadn't seen mum since our wedding in 2008 and hadn't seen dad since 2006. This year has brought me a new little nephew, Avery, who looks to be a little gem, and I can't wait to meet him in February, another trip to Australia. In sad news, 2010 saw my mum diagnosed with breast cancer, a routine mammogram showed a lump, and as it transpired mum had an aggressive form of breast cancer usually seen in younger women. And so began the onslaught of chemotherapy, mum has been neutropenic which landed her in hospital, and has had a number of complications of the chemotherapy, the most pernicious being anemia. I have been amazed and proud of how my mum has dealt with it all as if she has a bad cold, but does need reminding every so often that she is a cancer patient and needs to behave like one! In happier news, 2009 saw the purchase of our first house! We previously lived in a tiny one bedroom flat. We loved the area we lived in, but unfortunately had been priced out of Stubbins, with our extravagant wish list! We wanted a back garden, three bedrooms and to not be on a main road, not a lot to ask, you wouldn't think. We found the ideal house, you've heard of "the worst house in the best street"? well this is quite the opposite, "the best house in the worst street!". It's not so bad, but our street does have its characters, and the only consolation is the next street down is far worse! But our house is on a great bus route, close to lots of lovely walking routes and a big country park, and we are very happy here. Also this year I started this blog, through which I have met many people, and learnt a lot. I hope I have been able to give back a little as well. Which brings to mind some resolutions. 1. Now that mentally I am back on track my resolution for 2011 is to look after myself physically. To exercise more and to eat better. Hopefully that results in weight loss, but that is not my resolution. 2. To focus on the future for my blog and my writing, and to seek further opportunities. I don't get sponsorship for my blog, I just tap away quietly on my own, so I want to learn more about mummy blogging and looking towards the future, perhaps about publishing too. 3. To continue to be the best mummy I can be, and to help Joseph reach his potential. I hope to get involved in more groups, and to find more activities for Joseph to do, perhaps, additional income permitting, sending him to nursery one day a week. 4. To get our garden sorted, the front is not too bad, but the back is just grass and I have big plans, a rockery/Pirate island on the left and veggies on the right. 5. To read more! We don't have a shower, we have a bath, so my resolution is to read at least 2 nights a week in the bath! There are so many books I haven't read! I'd like to finish by saying thank you to you, my reader, for following my story, for supporting me and Joseph (and hubby too) and for reading, and I hope for many more readers to join me in 2011. Well the day is done, Joseph's second Christmas on planet earth, and it's been the first Christmas day I have really enjoyed in the last three years. Christmas 2007 I was in the early stages of pregnancy. I'd had norovirus on top of pretty relentless "morning" sickness (who is the sick male person who called it that??) and was not feeling Christmassy. My dear neighbour Rita cooked all the vegetables, I cooked the meat, and it was quite a pleasant day afterall, but not stunning. Last year I was mentally ill. My post traumatic stress disorder was getting worse before it got better, I was still on high alert and distressed. Joseph got ill and we spent boxing day in Accident & Emergency. Thankfully it wasn't serious and he was on the mend swiftly. This year, it was joyful. We have dear Aussie friends staying with us, who have also walked a similar path to ourselves with their son. Presents were wrapped and unwrapped, food lovingly made and consumed, children played, shared, fell over, cried, laughed and danced. It has been a day of snowy walks, of chatting, of reminiscing, and sharing. It's been everything a good Christmas should be, apart from missing our families at home, and feeling some sadness for those who have not been able to enjoy Christmas. A large part of this evening was spent thinking of those whose children cannot be with them on this day, whether in hospital, or whether, like "Bob" they have joined the angels. We think of those who are ill, or who have famil members that are ill. My own mother has, this year, embarked on a journey with breast cancer, and has come to the end of gruelling chemotherapy treatment. We think of those whose loved ones are in Afghanistan, or preparing to go, or are in other areas of conflict. Christmas is a time of hope. A time when we celebrate hope coming into the world, whether you are religious or not, or Christian or not, Christmas is a time when we reflect on the good in our world and in our lives, and in the absence, in this country at least, of its own special day, a time where we give thanks. So at the end of this day, I would like to say thanks, for friendship, for family, for children and most of all, for love. Before Joseph was born I had never heard of ROP, retinopathy of prematurity, but unbeknownst to me, I was aware of someone who has been affected by this condition. Stevie Wonder lost his sight due to ROP. When babies are born prematurely many things have not quite finished developing and the eyes are one of the things that are particularly vulnerable. Some of the things that happen on the neonatal unit, such as oxygen therapy, can damage the eyes, causing ROP. The good thing about ROP is that, unlike in Stevie Wonder's era, its largely preventable. Here in the UK there is a defined protocol for detection and treatment of this condition. I won't go into detail here about the ins and outs, but have linked to the protocol if you want to know more. Joseph had his first examination when he was 30 days old. His examinations were fortnightly until discharge, on a Tuesday. The examination consists of regular administration of eye drops in the hours leading up to the test. Then a highly qualified opthalmologist looks at the babies eyes. This is not a comfortable procedure. The first time it was done, I was asked to leave the unit, not just the room, which I did. The second and third times the test occured in a seperate room. I could hear Joseph screaming from down the corridor. I was incredibly distressed. I was not permitted to be in the room with him, as it was considered to be too distressing. When it comes to eyes, I am not squeamish. I had procedures done as a child, I have supported my clients in eye examinations when I was a carer, I found it far more distressing that my child was upset and I was not there. Joseph was due to be discharged on a Tuesday. The opthalmologist was late, and didn't get to the unit til after 3, and had to see some outpatients first. I was chomping at the bit to get my child home, I really really wanted to see the back of that place. The lovely opthalmologist called us in, the nurse that was assisting got called away. The opthalmologist apologised and said that he would postpone the test until the next day. I went white. "You can't, I want to go home, my baby needs to go home, what do I have to do?" The opthalmologist looked at me and said "well, in 20 years of practice I have never seen this, but you could hold him, but most mothers would pass out". One of the nurses overheard and called out "Kylie isn't most mothers, she'll be fine". Joseph was swaddled, lying on my lap. I sung gently as the eye doctor clamped Joseph's eye open and started looking behind it. Joseph didn't cry. He whimpered a tiny bit, but he didn't cry. The doctor moved to the other eye. As the test finished he said to me "you could be an opthalmic nurse, you've done a marvellous job. Now go home!" On that note, discharge was complete and we were out of there, 76 long days had come to an end! And Joseph didn't have ROP. When I was a baby, my mum didn't really record things, I never had a baby book. When I found out I was pregnant I was determined to have a baby book, and keep a detailed record of my baby's firsts. Unfortunately, when Joseph arrived at 27 weeks, all I felt was shock and as if my world had been ripped out from beneath me. Everything was recorded by the hospital, every breath, every mil of milk, every interaction. It was hideous. The last thing I wanted to do was to have more records. I did go to Mothercare when Joseph was in hospital to get supplies, and also to have a look at baby books, they all seemed just so ridiculous. Nothing really was relevant to a baby who lived in a hospital. I felt sad, and as if I was the only person in the world who was in this situation. Imaging my delight some months ago when I discovered this little business. 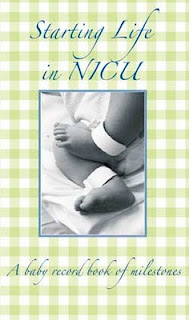 I was reluctant, at first, to buy "Starting Life in NICU" as I had not recorded anything was it happened. However one of my Twitter friends showed me how to download my facebook record, and most of Joseph's milestones are here. It is ringbound with large pages and lovely sections. It is designed with the special care baby in mind so includes things like "I am breathing: by myself/Oxygen/Cpap/Ventilator, I have monitors for..... I have IV lines for...." etc. As the book progresses there are pages for NICU firsts, such as first cuddle and first time I breathed by myself, as well as my first bath. There are pages for follow up appointments and milestones. For me, this book normalises our experience as a family, and turns it into something positive and as Joseph grows older, it will help me explain his start to him, and that it is something he can be proud of. I only wish that it had been around when we were going through NICU as I think it would be a lovely gift for a parent going through this experience, or even a first birthday gift for a parent, so that they can look back on that time, and fill it out. I am looking forward to going through my records and my photographs of Joseph and completing the book. I can't promise that there won't be the odd tear stained page. Isn't language an amazing thing? I often wondered how babies acquire and use language, and it really is remarkable to have access to this thriving, living sponge, and see what he takes in and what he uses. A few weeks ago, we went to buy his winter coat. Now I have always, even when he was pre term, spoken to Joseph in a conversational manner, asked him questions etc. People have thought I am mad, but I don't care, nothing new there! So I got three coats out a green, a red and a yellow. Chit chatting away, sounding annoyingly like a children's television presenter I said "which one would you like Joseph, the red, the green or the yellow?" and this little voice says "lello". I look down, and there is my little boy looking at me, very seriously. A lady behind me said "well looks like you'll be getting the yellow one!". Now this coat is rather yellow. Some people might even say its hideous. I changed the order of the coats and asked again. Joseph looked at me as if to say "for goodness sake mother you know the one I want" and said again "lellow". So we bought it. What was funny is that up to that point Joseph said fairly standard baby words "mama" "daddy" etc. I had no idea he knew what colours were! I don't recall teaching him colours, but that's just it. Babies are sponges. They pick things up by osmosis and then apply them when they see fit. Joseph has always been a funny, happy chap, but now there is some language he is hilarious. We have had snow the last few days, and Joseph is not a fan. We had to go out this morning to do some last minute Christmas shopping, I was putting his coat on and he said "no, no, no, no" as if to say "I am not going out in that!" Another trick is to stand in his cot and throw things out. I can hear this wee voice saying "oops oops". I also love the word substitution. There is a popular programme here for babies called Waybuloo, they do yoga in each episode, which the call (somewhat annoyingly) "yo go". So now, Joseph says "go go" for yoghurt, because of course "yo go" means television! The other thing that is amazing is accent. Being a stay at home mum, Joseph is with me most of the time, I have an Australian accent (think Dannii Minogue rather than Crocodile Dundee), my husband has a very thick Lancashire accent (like the nodding dog on those stupid insurance adverts). Joseph's accent is somewhere in between. What I am hoping is that a lot more language development will occur around 20 months, we'll be in Australia, and it will gladden my heart if he speaks with an Aussie accent, even for just a couple of months! Christmas is approaching swiftly, just 3 days away. It should be a time of great joy, of sharing, of happiness. It is a day for children, for laughter, for celebrating life. But somewhere a mother is deeply grieving. I’ve struggled at how best to share this story. This story really belongs to the mummy who loved him, who carried him, and perhaps in time, Michelle can share her story here. I’ve decided to go with my initial thoughts, and write a letter to this precious child, that we will never really know, but whom we love so dearly. Your name isn’t really Bob, it is Nathan. Nathan James, a beautiful, strong name, for a brave, beautiful boy. I met your mummy through Bliss, your brother and sister were both born prematurely, born too soon, and had to stay in hospital. Your mummy found this very very hard, but instead of just forgetting what had happened and getting on with her life, she found time to support others, like me, whose babies have also been born too early. When she fell pregnant with you, she was so excited, but so scared, that you might come early too. She saw doctors and midwives, she had a stitch, she had lots of appointments, and she shared her journey with us through the computer. We felt joy when she and your daddy started to feel your kicks. We smiled at your nickname, Bob, and we were amazed at the size of your mummy’s bump. Every week that passed, we were all so excited, it was a week closer to a “safe” time for you to be born. On your mummy’s computer there is a page called Facebook, and there were so many messages willing your mummy on, and praying for your safe arrival. 35 weeks came, and things started to escalate. Your mummy had gestational diabetes, there was talk of removing the stitch, and that you might be born around Christmas time. But, my darling Nathan, it wasn’t to be. I don’t really know what happened, I know there was probably an infection in your mummy’s tummy. I know, that you probably fought very very hard, but so sadly and so tragically for us all, you passed away, and had to be born. Nathan, I have seen your pictures, you in your daddy’s arms, him looking at you with such love and such sadness. You tucked up in a crib with your teddy, your perfect lips, your beautiful dark hair. I have used beautiful so many times in this letter, but you really are a beautiful, perfect angel. Nathan, I don’t know how to help your mummy, I know the only thing that would help is to turn back time, for you to be with her, well and happy, and now her page on the computer is full of grief, of candles, of flowers, for the little boy who should be at home, surrounded by love, with your first Christmas presents. Nathan, our perfect angel, we can’t make sense of what has happened, we can’t turn back time, but what we can do is remember you, is hold you in our hearts, and we can try, in our small way, to help your family, who miss you so very very much. On 3rd December 2007 my husband and I went out for a lovely meal to celebrate our first wedding anniversary, we could never imagine that only 3 days later we would be parents to a precious little boy. The 4th December was a usual busy day at work, and then we had a midwife appointment at the hospital on the 5th. My pregnancy hadn’t been great, I’d been very sick but then, at around 22 weeks, I started to feel better and started to enjoy it. There had been some debates about Luke’s growth at 20 weeks so we had an extra scan at 22 weeks. It had then been decided that everything was OK and so here we were at 32 weeks for a “routine” appointment. We knew something was wrong…they don’t usually offer you free scan pictures! The consultant was called and told us “this baby is very, very small and to give it the best chance we need to get it out”. Our friends had recently had a baby of around 4lb so that is what our concept of “very small” was, we froze when she said “no, I mean around 1lb”, we’d never heard of babies of that size before. So that was that, an emergency section followed and this is how we came to be in hospital at Christmas. Luke was born at 32 +1 on 6th December, weighing 1lb 10. They put his chances at 40%. The first 2 weeks were spent by Luke’s side and in the wonderful Ronald McDonald parent accommodation. Then we got the bittersweet news that Luke would be transferred. Great, because this meant that Luke didn’t need the intensive care of our original hospital, terrifying because it meant a 45-minute drive and to somewhere we’d have to leave him. I’d been organised and bought and wrapped the presents in late November. I remember arriving home without him for the first time and madly scribbling “and Luke” on all the gift tags. On Christmas Day we arrived at the hospital and our first surprise was an envelope to “Mummy and Daddy” – the nurses had taken his picture and made us a Christmas card from Luke. Then we also noticed he only had a feeding tube and apnoea monitor in – as a surprise for us the nurses had said that Santa had taken away all his other wires and tubes! Father Christmas has also left him presents of a snowman and a Christmas bib. We had bought him a Christmas card and stood it up by his incubator. One of the frustrating things was that there are no premature “first Christmas” clothes. My sister had bought a little Christmas mouse and one of our neighbours had found a little blue “Babys First Christmas” stocking- I think it was meant to put on the tree, but it was ideal to stick on his incubator. Apart from that it was business as usual on the unit. One couple had twins in different hospitals so they just grabbed a beans on toast in between visits. We went to the In Laws for Christmas dinner and all had a toast to Luke and hoped he would join us next Christmas. Tears were shed and although he had never been there before there was a noticeable gap at the table. We then returned to the hospital and spent the evening with him. And here we are in 2010 and Luke has just turned 3. Each Christmas we visit the Unit and give chocolates to the staff. Luke is a happy, confident little boy and is so excited this year – everything he sees he tells us how he wants it for Christmas! Someday he will understand that all we wanted for Christmas was him. Since Joseph has been born, I have become very active on Twitter and Facebook, and often am caught by stories of other children who have obstacles to overcome. This weekend I “met” Marie whose son Alex has a challenge ahead of him. Marie and her family live quite close to us, but without Twitter and Facebook we never would have met. Alex has a form of cerebral palsy, spastic diplegia. This affects Alex’s legs. Alex can walk, but he needs splints to help him, as the muscles in his legs are too tight. He is not as stable as other children, and is prone to falling. As time goes on children become more aware of those who are different, those who can’t keep up. 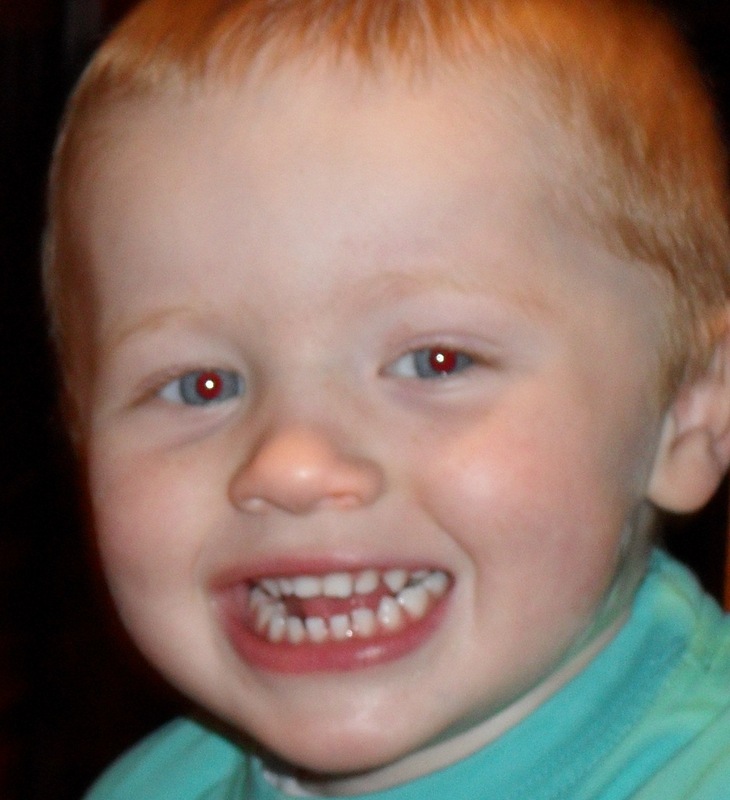 There is a treatment for Alex’s condition, an operation known as Selective Dorsal Rhizotomy. This is not new surgery, it has been performed at St Louis Children’s Hospital in Missouri by Dr Park for well over 20 years. 2 000 children have undergone surgery, and the success rate is reported at 100 %. Unfortunately, although the treatment is proven to be safe and effective, the NHS have declined funding for Alex to undergo this procedure, as it cannot be done in the UK and the NHS have decided not to fund, in this instance, treatment overseas. As a result, his family have made the decision to self fund. They require our help. All of us. Please dig deep, every little bit raised will help Alex to have this important surgery, which will improve his quality of life, for the rest of his life. A great investment I am sure you will agree. I don't know what it is like to have Autism. I have a rough idea in my head of what it would be like, that feeling you have when you are on your own in a foreign country, in a busy market place, you can't understand anyone, no one can understand you. The gestures, the word, the sounds, unfamiliar and frightening. You can't make youself be understood no matter how hard you try, you retreat further and further, as things get louder, more confusing, brighter in colour. Yet for you, as a traveller, there is a refuge, your hotel, a bar, or ultimately, returning home. Imagine being in a place like this permanently. Where things are just out of your reach of understanding. Permanently. Where you know what sort of things work, but you don't know why. There is one thing that helps you make sense of it all. Your dad. I read this story last night. It seems inconceivable that in 21st Century Britain we can be talking about, what is effectively, forced institutionalisation. This young man has a loving dad, who is the expert in his care, he asked for 3 days respite care, and this has turned into some sort of nightmare, where seemingly, there are no solutions. Because Autism does not fit the Mental Health Act, the authorities have taken it upon themselves to decide what is best for this young man. My heart breaks for this young man, and his father. He has been separated from his anchor, from the one person who comes anywhere near to understanding and speaking his language, to help him navigate through the complex world he lives in, a maze of social interaction where opportunities for misunderstanding abound. In a previous incarnation I worked as a carer for children with special needs, several of my clients were young boys with Autism. One in particular was my favourite, he was feisty, funny and caring. He liked nothing more than to take his clothes off and run around, becoming more and more manic and excited the closer you got to putting his top on! He loved to swing, and to slide, and to smile and laugh. He also had "behaviour problems". I hate that term, but can't think of a better one. This young lad had had a procession of carers who couldn't cope, but I never found him a problem, and couldn't really see what the issues were, yes, he could be challenging, but I found if I took a step back and gave him space, there was nothing we couldn't over come. One particular afternoon this young lad's father was busy in the kitchen, and he asked me to supervise the lad's play in the front room. He took us in and shut the door. Within 5 minutes there was frantic screaming and yelling. Me. I had never been so terrified in my life, and I couldn't, despite my best efforts, calm down. I was hysterical. Dad rushed in, my little client was holding my hand, patting me, trying to calm me down. "What has he done? Let me get the accident report form". Dad looked resigned to another carer leaving them. "No no, look look", the little lad said, pointing to three pteradactyl's perched on the curtain rail. "Yes" I said, rather ashamed, "Your little boy is delightful, but would you please cage these birds!" This was a turning point in my relationship with this special little guy. He had recognised my fear, an abiding and life long fear of indoor birds, and was right by my side, comforting me, caring for me, until someone who could deal with the problem arrived. And after this experience, we were a team! People with autism, or ASD (autism spectrum disorder) need what we all need. Consistency, respect, regard and most importantly love. Stephen has been separated from the one person who is best equipped to give him all this. Please don't let this happen. Sign the petition. Blog. Tweet. Raise awareness. Bring Stephen Home. As a parent, I worry about bullying. It's a bit soon, I know, but its a big issue for me. I am already concerned because Joseph is small, and unless something amazing happens, he will be on the small side when he starts school. It's important to me because both my husband and I were bullied at school. He overcame his with his quick wit, and winning smile, me, I suffered. I was reading this today, sparked by a twitter post from BullyingUK. Over the years I have thought a lot about what happened to me at school, why it happened, and what could have been done to help me. I was always going to be a target. I was quiet and bookish. I couldn't do sport, in Australia, not being able to catch a ball, or run with the other kids, is a massive deal. One thing in the article that really spoke to me was I did not recognise I was being bullied. Until it was too late. My bullying began in grade 2. I was 7. I struggled at our dreaded PE class. This was 1970's Tasmania, we had to do gym class in our knickers and singlet!! Can you imagine that happening today? We were in our underwear! In the school hall! Under the watchful eye of Mrs Butler, who was like one of those gym mistresses in an Enid Blyton novel. It was hideous. I soon got singled out. She used to throw stuff at me, balls, little bean bags, to see if I could catch them. Every time, I managed to miss. I couldn't do stuff other kids could do. It was demoralising. After some discussion it was decided to send me to a special school one day a week. I was so relieved when I left primary school, it was very small only 130 odd kids, and I thought once I got to high school, it would be better. Our high school was massive, almost 1 000 kids. It got worse. The bullying became sexual in nature, as well as the usual taunts about my sporting failures. Girls started bullying me as well. My life was becoming intolerable. Then it went up a notch, people used to steal my lunch, or my homework. Or dump tins of red powder paint over my bag. I did nothing. My parents knew and tried to intervene, they wrote letters, they were ignored. No one really knew what to do. And you know the biggest problem? I thought the bullies were right. I believed them. I thought I was useless at everything. I thought I was stupid. I was scared of them. I retreated into myself, I spent my lunchtimes helping out in the library learning the Dewey decimal system, helping to cover books, assisting kids with their homework. I retreated further into my music, joining an orchestra, meeting other kids who loved to play music too. I joined a theatre company, and found other kids, like me, who were good at other things. I learnt to do stage make up, stage lighting and sound, and I learnt to act. I found that by immersing myself into hobbies I met other kids, outside my school. Kids who didn't realise I was spastic. I felt, at times a bit of a fraud. And you know what, I am ultimately very grateful I was bullied. Yes, it was horrible and isolating, but would I have learnt the violin, acted in several plays and become as well read without being bullied? I don't think so. But what I am exceedingly grateful for is that mobile phones and the internet had not been invented in 1970's Tasmania. Bullying now has taken on a whole new dimension, and its frightening. And its particularly scary to see the amount of young people who feel that suicide is the only way out. Bullies are winning on an unprecedented scale. We, as a society, as parents, and as adult children, need to fight back, educate and empower our kids so not only are they not targets, they do not turn into bullies. What sort of citizen do you want your child to be? It's never too early to teach good citizenship. Sunday was a really important day for us as a family. It was our local hospital's special care baby unit's Christmas Party, hosted by the Mayor of Bury. It is held every year, and children are invited usually the Christmas in the year following their discharge, so last year we weren't invited. I was so excited to attend this year's party for many reasons. Our unit is still earmarked for closure, although now the decision has been postponed until February, so this year may well have been the last party. Also for me, it marked the end of Joseph's journey as a tiny, premature neonate, he has graduated and has joined the other children at the party. I learned from one of the organisers that 300 babies pass through the unit every year, which is an amazing number, as the unit itself is rather small, 10 beds, with a couple of other rooms that can be used as well. That's a lot of babies. And of all the children gathered at the party, you would just never know that any of them had occupied one of these special beds. Joseph looked a picture in his Ted Baker outfit, which I will get a picture of at some point! He enjoyed chasing the disco lights on the floor, doing the hokey cokey, and his most favourite activitiy in the whole world, eating cake! Santa came, and he was very kind, and brought Joseph a Zingzilla microphone! Oh how we love the Zingzillas! And now, I feel, that even if we never go to one of these parties again (but I do hope that they can continue on whether the unit closes or not), that our work is done. It might have just been a kiddies Christmas party, but to me, it was a graduation ceremony. Congratulations my little man, you have passed with flying colours! I've mentioned many times that the Bliss charity has been instrumental in teaching me how to be a mum to a premature baby. One of the mothers who has inspired me, helped me, and encouraged me is Lizzie. During the run up to Christmas I thought it was poignant to share stories of NICU at Christmas. Here is Lizzie, Jon and Edward's story of their first Christmas as a family. Christmas Day 2005 was like none other. We knew it would be special: I was supposed to be exactly 35 weeks pregnant with our first child. As it was, however, Edward had been born 10.5 weeks earlier at just 24 weeks and 4 days gestation. Those first hours, days and weeks dragged by in a fearful haze as we didn’t dare hope that Edward could be strong enough to hang on. He had been born dangerously early. The one glimmer of hope was his weight – 1lb 9oz or 725g – very tiny, but very respectable for such an early baby. Christmas became an important milestone for me and my husband Jon. We knew that, two and a half months after his birth, we should by then have some idea of what the future would hold. Before Edward’s untimely birth we had originally intended to spend the day with my parents, but all plans were shelved and Christmas was officially cancelled. In our heads it became a day of huge significance, because if he was still with us by then, then maybe – just maybe – we would be lucky enough to keep him. We never discussed these thoughts between us, both afraid that if we verbalised our thoughts then somehow we would be jinxed. We were both so absorbed with every aspect of life in NICU that we barely noticed the run-up to Christmas. We didn’t send a single card; we didn’t buy presents. To us it seemed pointless: the one gift we wanted was a baby who was still alive and was growing healthier and stronger each day. On many days that gift seemed desperately far out of our reach, but as the weeks passed and the many frightening moments became fewer, we both began to believe that we just might get our Christmas gift. On Christmas Eve I dared to go out and buy a Christmas card for Daddy – I was frightened doing it in case something terrible happened before Daddy could receive it. We also plucked up the courage to buy Edward a single small present – a colourful cloth book to put in his incubator. Suddenly in a whimsical moment of hope I decided to dash to Waitrose shortly before it closed and buy up the few items of Christmas food that they had left on the shelves, because things were starting to look more positive, and we could allow ourselves to enjoy a Christmas dinner at home after spending the day with Edward. One of the key things I remember about Christmas Day was that most of the parents on the unit looked rather blank whenever anyone greeted them with “Merry Christmas”. Although we all knew what day it was, we all had so much more important things to think about and it felt very odd – it wasn’t supposed to just be another normal weekday, but it was to all of us. Edward was still in NICU at the time but was starting to do well – well enough that when the night nurses had secretly dressed all the babies in a Father Christmas outfit and taken photos for personalised Christmas cards, they had been able to include him. His card to us was waiting on the top of the incubator when we walked in. I welled up as soon as I saw the photo of him in his Christmas suit – I have no idea how the nurses made it fit so beautifully because he’d struggled to put on weight and was still well under 3lbs. That photo is one of our most precious possessions and is on display in our home all the time, but also gets included in our Christmas decorations every year! The nurses had done such a wonderful job decorating each room in the unit, and they were all extra cheerful that day, with Christmas songs playing quietly on the radio in the background. A kind volunteer had managed to get stockings and little presents donated for each baby in there, and we still have Edward’s stocking and cuddly bear now. I must confess that we didn’t keep the hand-knitted cardigan though – I hope I don’t sound ungrateful, but whichever kind soul knitted it, had done it for a baby at least 5 times the size that Edward was and I couldn’t imagine him ever fitting it! I remember actually staring at it in its hugeness and wondering what it was for! We had a little break at lunchtime and decided to ‘treat’ ourselves in the hospital ‘restaurant’. It was virtually empty, though there was a family sitting not far from us with a very elderly, very frail looking granny who was clearly an inpatient. I remember thinking that this was probably her last Christmas and feeling rather sad for the family. In contrast, I was beginning to feel that this just could be the first of many Christmases for Edward. Towards the end of our day with him, we were chatting about something and Jon finished the sentence, as we had hundreds of times before, with “....if Edward comes home”. I took a deep breath and dared to say it at last. “He is coming home, isn’t he?” “Yes, he is.” Edward was asleep in his incubator and not available for cuddles, but we had the biggest hug with each other, standing watching him sleep. Edward moved into the lofty climes of HDU on 2nd January 2006 and came home to us on 8th February, on day 120. We were a proper family at last. I have really started to embrace Twitter, its a great place to interact and meet people you never otherwise would have met. I have met this wonderful mummy via another via this lovely mum and Nicu nurse. I met Jenny whilst she was pregnant with triplets. She threatened preterm labour and managed to hang on until 28 weeks. Her three little babies are currently in NICU (neonatal intensive care unit) and doing very well, however they are subject to the usual NICU issues that all premature babies face, little setbacks, various health problems, and just the slow business of growing and learning lifeskills that full term babies take for granted - you know, life skills - like breathing, maintaining body temperature and the all important feeding. Yesterday, on Twitter Jenny was feeling a little low, post c-section, babies in NICU, expressing (for three!) takes its toll. She mentioned that her mantra was "tomorrow will be better". It got me thinking, what were my mantras in NICU? What were those little snippets that helped me through those long days? I am the Mummy - I repeated this over and over. It is very hard to feel like a mummy when your baby is kept in a plastic box, doesn't look like a baby and you are not doing normal mummy things. But you are the mummy, very much the mummy and no one, no matter how qualified, how experienced, can do the job you do. However dedicated the professional, they do not, and will not, love your baby. That's your job. Now is not forever - It is very hard to keep a sense of perspective, especially when you know that your baby is likely to be in hospital until their due date, and that is 3 months away. I remember my sister blogging at the time "she is learning to be a mother to a baby who lives in a hospital". And feeling desperately sad. But it wasn't forever. And now, its just memory, story. It happened, it was real, it hurt, but its over. The rule of three - One of the things I really struggled with was information, particularly about things that came down to opinion. Every nurse does things differently. And every nurse thinks her way is either the only way, or at the very least the best way. I was told to throw out bags of milk as I had frozen them after being in the fridge for 24 hours. At the time I didn't know how much he was taking so didn't want to freeze them straight away as fresh is better. One nurse said it was fine, the other said it was dangerous. I accepted the second nurse's opinion as gospel and chucked it. Several others subsequently said it was fine. So I then operated a rule of three, if three people said the same thing, I accepted it as truth. I know my baby best - Although your baby might be in special care, with things happening you don't understand, you have known your baby since it was conceived, and you can still trust your instincts. If you are concerned, speak out. One of the doctors wanted to do a lumbar puncture on my son, because they believed he had an infection. At this time Joseph was on pretty much the full spectrum of prophylactic antibiotics. I made the doctor tell me what indicators Joseph had of infection, and he told me he was having seizures. Now by that time I was spending up to 7 hours a day with him, so I asked him for dates and times. Some of these "seizures" had happened whilst I was there. I was sure it was constipation. It looked to me, to use the local dialect, that Joseph was "thrutching". During these "seizures" he was awake, he was looking at me, and his tummy was tensing. As it turned out, he was constipated, in the next 48 hours he did several poos, and the "seizures" stopped. No need for the lumbar puncture. You are not alone - When you are going through special care, you can feel desperately lonely. In our case our unit only had room for one long term NICU patient so no one else was going through what I was. However, I found support from unlikely sources. Cleaners, chaplains, one of the maternity doctors who used to lurk outside the unit for a cuddle and a quick catch up, even fellow bus catchers. I met one lady whose son had been in hospital for six months, and she went nearly every day to see him. We would swap notes, and give encouragement. She was in her 70's and her son was 40 and in long term psychiatric care. But I felt a strong affinity with this mummy, who was having very similar experiences to me, the feeling of social isolation, fear of the future, and disconnection from her son. And having to deal with things she didn't always understand. Its all character building - Sometimes I wondered why this was happening to me. But then I asked myself "why not me", if it has to happen to somebody let it happen to someone who will roll with the punches, who will learn from it, who will come out the other side with a richer character, and an appreciation of the whole experience. I would never, ever wish having a premature baby on anyone, its hard, its sad, and what the baby goes through in order to survive and thrive is tough. Most mummies cry when their babies have their injections. When Joseph had his injections, I was completely calm, grateful that was all it was. However, having a premature baby can be exhilirating, watching them grow and develop, and learn, its amazing. So whilst I would not advise going out of one's way to have a premature baby, use the experience, if it is thrown at you, to grow as a person, and importantly as a mummy.